Merrilyn Goos has worked in mathematics education for 25 years as a teacher, researcher, and teacher educator. She is a Professor in the School of Education, and from 2008-2012 was Director of the Teaching and Educational Development Institute at The University of Queensland. Previously she taught pre-service and postgraduate courses in mathematics education. 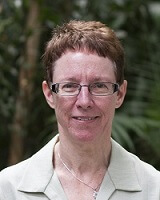 Her research has been guided by sociocultural theories of learning in investigating metacognition and mathematical thinking, analysing pedagogical issues in introducing educational technologies into mathematics teaching and learning, and studying how communities of practice are established and maintained in secondary mathematics classrooms and teacher education contexts.